NETWORK FINALS: On NBC, the RIO GOLD recap special gained 0.2 in final numbers, and the OLYMPICS CLOSING CEREMONY was up 0.1. Elsewhere, CELEBRITY FAMILY FEUD, BIG BROTHER and the FAMILY GUY rerun gained 0.1, but the MADAM SECRETARY rerun lost the same. CABLE HIGHLIGHTS: The network in the spotlight was AMC. The premiere of the back half of FEAR THE WALKING DEAD’s season was at 1.62, down 0.26 from May’s midseason finale, and down a much bigger 1.46 from the season premiere in May. It was easily enough to top the night, though. It was followed by the return of TALKING DEAD at 0.57, up 0.19 from May (when it aired after the PREACHER premiere rather than directly after FEAR), but down 0.49 from FEAR premiere night. An attempt to gain some zombie fans for a sneak of the season premiere of HALT AND CATCH FIRE didn’t accomplish much at 0.15. An episode of GEEKING OUT followed at 0.10. The rest of scripted was dominated by Starz’s POWER, up 0.11 from last week to 0.96, with SURVIVOR’S REMORSE up 0.05 to 0.41. On HBO, THE NIGHT OF had an impressive 0.15 spurt to 0.69, with BALLERS up 0.07 to 0.64, VICE PRINCIPALS up 0.02 to 0.41, and LAST WEEK TONIGHT up 0.07 to 0.45. At Showtime, RAY DONOVAN ticked down 0.32, and ROADIES ticked up to 0.11. 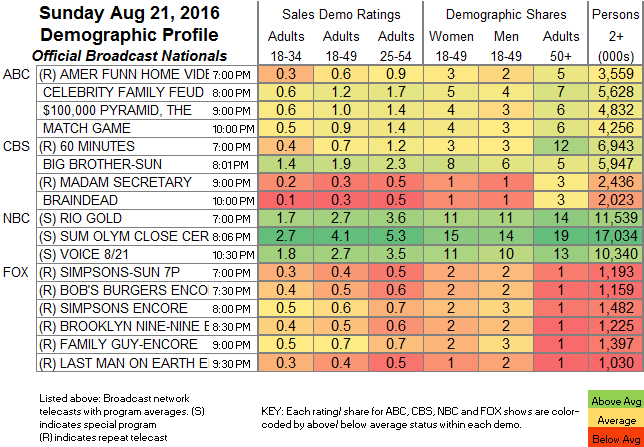 TNT’s THE LAST SHIP lost a tick to 0.47, while MURDER IN THE FIRST climbed 0.08 to 0.25. 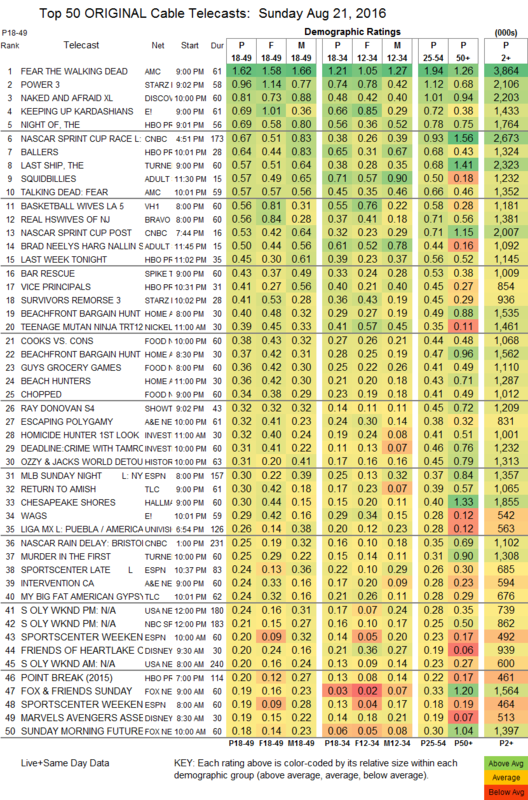 Adult Swim’s SQUIDBILLIES edged up 0.02 to 0.57, and BRAD NEELY’S HARG NALLIN gained 0.04 to 0.50. USA’s MOTIVE fell 0.04 to 0.16. What turned out to be the final 2 episodes of TV Land’s THE JIM GAFFIGAN SHOW were at 0.13/0.11, compared to last week’s 0.11.